I needed to do this for my own sanity. George Leonard was a writer, editor, and teacher whose passion was the exploration of human potential. 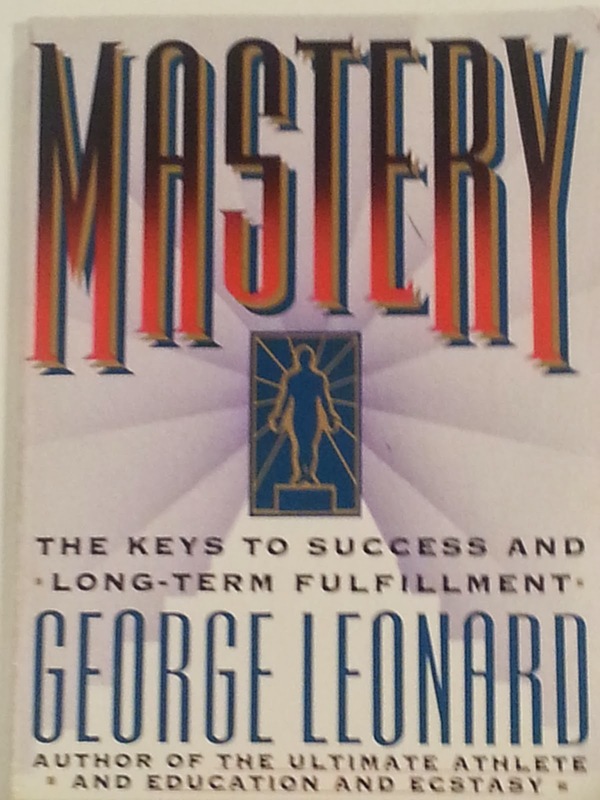 In the early 1990s, he published Mastery – The Keys to Success and Long-Term Fulfillment. It may help to point out that he was also a 5th degree black belt in Aikido, which like most ancient martial arts, sprung from a foundation of religion, spirituality, and mysticism. Over the past 10 years, I have read this book at least four times, and it has definitely influenced the way I view life, success, business, and now, physical training. But when it comes to defining what mastery is, I cannot quite get there. I can tell you that it is more than any dictionary would lead you to believe. 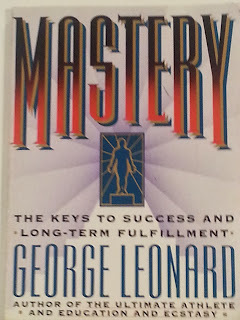 Leonard’s concept of mastery is much more than success, or excellence, or dominance, or skill, or expertise, though it certainly contains all of that. Pick your sport or your passion. It can be a javelin or saxophone; a barbell or a sauce pan; a volleyball court or a theatrical stage; a kettlebell or a boardroom. I cannot tell you what mastery is, but I think I can show you what it looks like. As far as the sport of golf is concerned, I am neither a player nor a fan, but I have to admit being intrigued and amazed by the early success of Tiger Woods, who not long after turning pro and winning the Masters was generally considered the best golfer on the planet and an odds-on favorite to become the winningest golfer in the history of the game. So how do you explain it when a player who was often described as having the perfect swing, decides to dispense with that swing and build a new swing from scratch? In fact, some experts say that by now, he has rebuilt his swing at least four times. I think it is safe to say that most athletes, whether pros or duffers, believe that, when it comes to technique, tampering with success is a fast track to failure and frustration – especially when that technique is already winning tournament after tournament. Many basketball fans consider the 1980s to be the golden era of professional basketball, and they credit Larry Bird and Magic Johnson as being the players most responsible for lifting the NBA out of the doldrums and exciting a new generation of fans with their unique abilities to lead their teams, the Boston Celtics and the Los Angeles Lakers, to victory. I was not a serious basketball fan during that era, but living in Celtics Land, it was impossible not to be aware of Larry Bird’s almost commonplace heroics which made him a 12-time all-star, earned him 3 MVP awards, and helped lead the Celtics to 3 world championship titles. But my outstanding memory of Larry Bird was seeing his ritual of being alone on the court before a game, shooting jump shot after jump shot, before any other player on either team even made an appearance. What was he going to accomplish with all of that practice? Wasn’t that jump shot already so perfectly embedded in his muscle memory that it could never be lost even if for some strange reason he wanted to lose it? And that brings me back to Tiger Woods and my outstanding memory of him. It was a Nike commercial, where he is repeatedly and flawlessly bouncing a golf ball off the head of a golf club, as though he was hitting a tennis ball off a tennis racket. He softly hits the ball up in the air in front of his body, then moves the club behind his back, and then through his legs. The ball never stops until he makes it land and rest, incredibly, on the head of the club – with seemingly unnatural control. If you are involved in sports or fitness at any level, you have likely bumped into a coach or trainer who preached the gospel of the mind-body connection. But George Leonard operated on a different plane. He preached the gospel of the mind-body-spirit connection. We live in a culture that preaches measurable accomplishment. Competitors train and hone their skills with their eyes on the award, the trophy, the championship, the MVP. We, the more ordinary humans, seek our own individual milestones: losing 25 pounds, adding 50 pounds to our best deadlift, running 26 miles in under 4 hours, or seeing our first poem or short story published in a magazine. We set our sights on goals that keep us working and that keep us engaged in our training. How many incremental steps are there to shooting a jump shot? If you or I might break it down to 5 steps or 7 steps, is it likely that Larry Bird broke his down to 10 or 12 steps, examining and perfecting micro-movements that are invisible to most observers? And what about Tiger junking his seemingly perfect swing? Could it be that he saw microscopic components that did not mesh as perfectly as he wished they did and as perfectly as spectators and critics believed they did? Your goal is to throw a 95 mile per hour fastball – literally or metaphorically. You started with an 88 mph fastball. Your version of this goal could apply to any other sport, or fitness challenge, or life mission. You practice religiously. You get good coaching. You adjust your mechanics. You practice your new and improved motion, and It begins to payoff. You are consistently throwing at 90 miles per hour, and you continue to practice, and practice, and practice, but your progress comes to a stop. You feel that you are getting nowhere. You have reached the dreaded plateau. So, what do you do? It is here, on the plateau that many give up. But if you decide that you are on the road to mastery, you will have no reason to give up. You understand that you must embrace the journey. You realize that true progress comes in small incremental steps, and that those steps may be so small that you cannot see them. When your fastball went from 88 to 90, it seemed to happen all at once, in a great spurt of progress. But, in reality your skill improved before you saw the measurable result. Now, on the plateau, while you are focused on every micro-component of your arm motion, you are continuing to improve, even though you have not seen the measurable proof of that improvement. So, when that next spurt does happen and the radar gun tells you that you are now throwing at 93 mph, you of course enjoy those fruits, but your road to mastery demands that you continue to practice and hone your skill, while you look forward to your next plateau. Are we now getting closer to solving the mystery, or are we coming to terms with the truth that the mystery of mastery is not quite solvable? The destination never stands still. If we are fortunate enough to find our 95 miles per hour fastball, we will either set our sights on 96 or we will find the components that need to be fixed or replaced to have the most efficient and consistent 95 that we can possibly attain. For Tiger Woods, the perfect golf swing is one that he has not yet discovered. For Larry Bird, the perfect jump shot was farther down the path. For you, the perfect deadlift, tennis serve, kettlebell swing, 10K road race, chess match, or whatever may be your own personal fastball just might be a lot more than what you see in the mirror, on the radar gun, or on the stat sheet. It might lie deep in your soul. It might begin with the simple joy that comes with your deep connection to the golf club, or the basketball, the barbell – your fingers on the seams of the baseball, or on the strings of the guitar, or in the garden soil. A true master never stops being a learner. And a real detective never stops searching until the mystery has been solved. I spent two and a half decades wearing a certain suit. For nearly all of that time, I was quite confident that it fit me to a tee. So, what do you do? That is the question that you get from strangers that either begins a conversation or changes the subject. I am in the trade show business usually triggered the latter, since most strangers had no idea what that meant nor did they care to find out. When a stranger would express an interest in what I did and why I did it, I likened the job of running trade shows and events to being in the carnival business. You go to different cities. You take a big empty space and you fill it with attractions and booths. People sell. People perform. People buy. Then it closes and you take the trade show or the carnival to the next town. It did fit me to a tee. Some shows were great because they drew big crowds. Some were dreadful because they drew tiny crowds. Most were simply middle of the road but I almost always believed that I would eventually find the key that would make them great. Over the years I worked with quite a few others who entered the business after I did. Most of them did not enjoy it, and they left. But I was somehow suited for it – the highs and lows and all those in-betweens. It often seemed (falsely) that customers either loved us or hated us. You had to find ways to make that balance work in your favor, which I somehow was able to do. When you have a perfect fit that lasts for almost two and a half decades, you probably do not consider that there might be an expiration date. But, for me, there was. Now, the suit that I wore for two and a half decades hangs in my closet. I wear a t-shirt and workout pants. I became a personal and group trainer, and kettlebell instructor. My favorite clients are optimistic men and women in their 50s, 60s, and 70s who are hopeful that they can get strong in spite of their injuries, surgeries, and health problems. 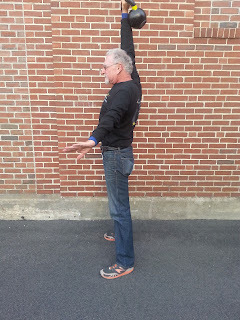 One client, in his 60s, has Parkinson’s disease, forcing him to deal with unnerving tremors that begin in his left hand and work their way up his arm. The tremors quiet down when his hand grips an object. When he completes a vigorous routine with his hands gripping the handle of a heavy kettlebell, he is tired, relaxed, and happy with the feeling that he is getting stronger, in spite of the beast which inhabits his body. Observing such results has helped me grow comfortable in my new suit. Thank you for listening. I will see you here again – sooner, rather than later. P.S. I write about fitness at Train Brilliantly! You disappeared rather abruptly. I suppose you could say that there was no reason for you to hang around. After all, the game ended, and you lost. And you will never get another shot. Maybe you needed to be alone, or at least alone with your family, and friends, and associates. You never struck the rest of us as being the type who would need to crawl into a cave and lick your wounds, but then again, we did not know you. We only saw that slick, hyper-confident veneer. Beneath that mask, there might have been a shattered expression – a silent scream. Perhaps, but we will never know. Still, it is odd not to hear at least a peep of your once ubiquitous voice. You had so much to say, and you took every appropriate and inappropriate opportunity to say it. Did you forever lose your voice the moment after the famous fat lady sang? Did your opinions, whatever they genuinely were, suddenly evaporate? The big issues and angry debates certainly haven’t diminished. In fact, this new civil war is as bitter and dangerous, and for some, as exciting and energizing as it ever was. So much has been decided by your defeat, but even more remains in play. It goes on without you. So, why the silence? What happened to your passion? Was any of it real, or was it all just about closing the deal, and not really about changing the future? No need to answer. I think most of us, including your temporary, hopeful friends of convenience, searched for your soul and came up empty. And, please do not lecture me that too many of us have a problem with ambition, and that we begrudge you your wealth and success. No one enters the biggest of all races in the free world without lofty ambition and enormous ego. But, the worthy ones also bring big ideas and deep conviction, and there lies the difference between the margarine and the butter. It is unhealthy to eat a phony food that is made in a laboratory and is a molecule away from being plastic. Take a stick of margarine and a stick of butter and place both in the backyard of one of your homes, in one of your many “home” states. The squirrels and the raccoons will devour the butter and leave the margarine untouched. Instinct protects them. And, our collective wisdom protects us. We are wiser now because you reminded us that a false product is usually the least healthy choice. Thank you for that reminder. Thank God for that reminder. This was Gertrude Stein’s advice to aspiring writers, which I have always thought was exquisitely elegant in its simplicity, as well as appropriate for those in other walks of life -- take for example those aspiring to be President of the United States. Michele Bachmann told us that the shot heard ‘round the world was fired in Concord, New Hampshire, and that the Founding Fathers fought tirelessly to end slavery. Rick Perry told us that the voting age is twenty-one, and that there are eight justices on the U.S. Supreme Court. Herman Cain told us that the Taliban would be involved in any newly formed government of Libya. They all repeatedly told us more than they knew. Of course they had to. What they actually did know was not enough to be a serious applicants for the job. Though we often doubt the intelligence of our friends and neighbors, we are, as a whole, a reasonably intelligent electorate. We have what city people have always referred to as street smarts. As we grow-up (early for some and later for others), we learn to develop our factory installed B.S. detector. To paraphrase the single greatest leader America ever produced, all of us can be fooled some of the time and some of us can be fooled all of the time, but all of us cannot be fooled all of the time. So, I ask you Mr. Romney, Do you believe in Gertrude Stein’s platinum rule? When your lightweight opponents continued to tell us more than they knew, we were more than happy to be amused, though we were more than a little disturbed by them having a seat at the game table in such a high stakes game. They came to remind us of the blowhard at the cocktail party. When we cannot listen to one more word of his nonsense, we slip from his sight and escape to the kitchen to make fun of him. Newt still assures us repeatedly that he knows more than most other mortals, including you. He of course knew more than any of the other contenders, though he was careful to explain that you and all of them knew more than the man we foolishly elected to lead us. Then Newt presented you with the right to laughingly characterize him as “Lucy in the chocolate factory,” when he learned that he failed to get on the ballot in his home state of Virginia. He then called for a write-in vote, but Virginia forbids write-in votes in its primaries. He did not know what he did not know. And so he promised to give us $2.50-a-gallon gasoline, if we would just give him what was rightfully his – the coveted seat in the Oval Office. He told us he knew how to do it. One problem: we did not believe him, because we no longer believed that he knew what he told us he knew. Yes, he got a little carried away. He is a man who likes to lecture. So lecture, he did. He lectured women on some very personal matters. Did you believe your good fortune? He heard the rumblings from the offended gender, but he dug in. After all, God was on his side. But women were not. In droves, they deserted him for you. Could you have ever delivered the kind of blow that he landed to his very own chin? You know the answer to that question. If you pack that kind of a wallop, you have not yet shown it. But, we cannot fault your strategy. You chose to remain silent. You, the victor of bloody corporate battles, understand and appreciate the famous axiom: When your enemy is destroying himself, stay out of his way. And your enemy was not quite finished destroying himself. He had one more blockbuster punch to land. He stepped to the center of the ring and took on the memory of JFK. The issue was separation of church and state, but the issue hardly mattered. He threw the clumsiest big time punch we had ever seen, which prompted television news programs to run clips from 1960 of the young contender from Boston addressing Protestant ministers in Houston, displaying his eloquence, intellect, and humility. In reality, he was speaking to a much wider audience. He was an American who happened to be Catholic, speaking to Americans who happened to be Protestant, Catholic, Jewish, Quaker, Baptist, Unitarian, or none of the above. He spoke to our better selves. And then we watched the holy warrior from Pennsylvania say, “You bet it makes me want to throw up.” It was a stunning boomerang-punch that knocked him senseless. He stumbled around and stumbled around and then weakly climbed out of the ring. So here you are – preparing for the main event. The Champ is unlike any opponent you have ever faced. He will not give you the gift of knocking himself out. You will not be able to out-spend him, or out-organize him. He will not make the mistakes of an amateur. He knows your weaknesses and will skillfully exploit them. There will be defining debates, where you will face him on camera, mano-a-mano, and eyeball to eyeball. You have survived a game of elimination. That is all you have done, and it was enough. You stayed in a crouch, with your hands protecting your chin. At every opportunity, you told us less than you know. So, what now, Governor? Are you willing to get hit in order to land some blows? That is what we need to see. Not to take pleasure in seeing you with a split lip, and a broken nose, and purple, swollen eye lids, but to see if you are willing to fight through pain that you have never before felt and exhaustion that you have never before experienced in order to win the right to lead all of the people. – which I hope will be brilliant ideas - will be mercilessly attacked and ridiculed, but may very well win the day. Sir, I am sorry for laughing. I know that this is no laughing matter. It’s just that, well, are you aware that you are the absolute master of understatement? No, I am not exaggerating. You are for sure the best that we have ever seen. The people have taken to the streets. There are signs that their numbers will continue to swell. Have you really asked yourself why in the world they would leave their homes and sleep on concrete? To be sure, some are enjoying the theater of it all. That goes without saying. And of course there is that old arm-in-arm camaraderie, shared by those marching for a cause. But at the heart of it all, there is something much more serious and worrisome and real. How does the saying go, misery loves company? Well, if they are just the tip of the old iceberg (which many of us suspect is the case), then there are quite a few miserable folks out there in the kingdom, wouldn’t you say? Misery is an awfully good word. You should think seriously about using it. True, some of your enemies might accuse you of hyperbole. You are afraid of that, aren’t you? Were you to utter that word, some of your enemies might stick you with it. Remember when that happened with malaise? That was a bit before your time, but you are a student of history. Some would blame you for causing the misery, and others for at least failing to cure it. That’s what enemies do. And your enemies will do that in spades. Your enemies want you gone. Your enemies want you humbled, discredited, even humiliated. Your enemies are eager to gloat. And, that is where the no-small-matter of courage comes into play. Sir, it was most disingenuous of you to characterize these people, in the streets – your people – as being frustrated. Frustrated? I am frustrated when a pull-top breaks off and I can’t open the cat food can. I am frustrated when I can’t keep the squirrels off of my bird feeder. I am frustrated when I can’t get a signal on my cell phone. I am frustrated…well, you get the picture. Frustration? Sir, you can and must do better than that. Frustration is so 2009! Let’s stop and count the homes that have been lost, the careers that have evaporated, and the futures that have been derailed. Let’s, for a moment, consider the mountains upon mountains of misery. Would it be so terribly out of character for you to use real words? Words like anger, or even rage. Words like despair and fear, or phrases like scared to death? Because, that’s the stuff that is filling the streets. You know that, don’t you? You know damn well that the game they were playing – the game that always was more or less honest – somehow became rigged. It was stolen by people high up in those buildings, standing in the windows, and laughing like hell at all of us, including you. Back when the game was more or less honest, and the rules were more or less fair, there were lots of winners. Hard work and sacrifices usually paid off. Combinations of risk and creativity and resourcefulness just might hit the jackpot. You don’t owe anyone a home, or a job, or a business, or a jackpot, but you do owe them a seat at a table with a clean deck of cards. No, we are not naïve. We know that you cannot just wave your hand and make that happen. But you can shake a fist in front of the faces – those well tanned, over-fed, contemptuous faces -- of those in the bonus-no-matter-what club who mock us and mock you. And you can call them by their name – their real name. You can call them thieves. You can say loudly and clearly that the ring of con men who so cleverly sold us blue smoke blown into so many tiny, unnoticeable, tightly sealed boxes were quite simply gangsters without guns. Why not say it? Who or what is holding you back? Is it the loyal opposition? The other side, who so underestimated you (God, we hope they did) that they marshaled their forces in the most insulting manner. They sent in the clowns. They sent in imbeciles who do not read and did not bother to learn history. They sent in a slick salesman who knows how to sell what the market demands, and who will quickly and smoothly switch his product-offering the very moment the market demands something else. Where do you think that leaves us? Sir, it leaves us with you, and your words which, I was about to say, are disappointing. But disappointment is so 2010. He was away on a business trip, and after three long months, he was happy to be finally going home. To be with his wife and his six month old baby. To sleep in his own bed. To eat home cooking. To be back in his office. He, and two of his co-workers, set out for the train station, but then he remembered that he had left something behind, so he turned and headed back to the shipyard, where he had been working as a draftsman, designing oil tankers. It was 8:15 a.m. on a clear August morning, and he later would remember being in good spirits when he heard the sound of a plane. He looked up, saw a blinding flash in the sky, followed by a deafening boom, and then he was blown over and knocked unconscious. When Tsutomu Yamaguchi woke up, 70,000 people were dead, another 70,000 lay dying, and 60,000 buildings had been turned into rubble. Because the sky had been clear, providing perfect visibility, a specially modified B-29, affectionately named the Enola Gay, after the pilot’s mother, was able to drop a single bomb, ironically nicknamed Little Boy, on the city of Hiroshima. The bomb, which contained the equivalent of 20,000 tons of TNT, took 43 seconds to fall to the point of detonation. The mushroom cloud was estimated to have reached a height of 40,000 feet. Two other bombers, carrying cameras and measuring devices recorded the damage and gathered data. While Allied planes had systematically bombed 67 Japanese cities, Hiroshima had been intentionally left untouched, making it not just a strategic target, but a perfect laboratory for this hellish experiment. Yamaguchi picked himself up off the ground and made his way through a devastation he could not comprehend to a bomb shelter where he spent the night. He had lost some of his hearing and he had some bad burns on one side of his body, but he was remarkably intact. The next day, he made his way back to the shipyard, found his two co-workers, and the three men boarded a train for home. After the war, Yamaguchi worked as a translator for U.S. occupation forces. He never believed that Japan should have attacked Pearl Harbor. He never expressed anti-American sentiments. Perhaps he believed, as many did, that in bringing an immediate end to the war, the atomic bomb had actually saved more lives than it stole. Later he went back to work for Mitsubishi Heavy Industries, trying to pick up where his life had left off. He lived quietly and anonymously for decades, until his son died of stomach cancer at the age of 59, most likely caused by radiation exposure. Then, Yamaguchi became an outspoken critic of nuclear weapons. Remarkably, Tsutomu Yamaguchi died at the ripe old age of 93. Remarkable indeed, because, that day when Tsutomu Yamaguchi took the train out of Hiroshima, he was headed home to the city of Nagasaki. On August 9th, three days after the attack on Hiroshima, a heavily bandaged Yamaguchi reported to work. The news of Hiroshima had not arrived ahead of him. The bomb had taken out virtually all communications networks, so at least temporarily, what had happened to Hiroshima had stayed in Hiroshima. He told his boss what had happened and his boss did not believe him. A single bomb could not possibly have destroyed a city the size of Hiroshima. He looked at the injured Yamaguchi and accused him of speaking nonsense. Yamaguchi was stubbornly sticking to his story, when in the sky above them, at 11:03 a.m., the B-29, named Bockscar dropped the bomb, nicknamed Fat Man. Once again, the blinding flash, the deafening boom, and Yamaguchi was knocked to the ground. The explosion generated heat of 7,000 degrees Fahrenheit and winds of 624 miles per hour. By the time he came to his senses and got to his feet, the black sky, the prismatic mushroom cloud, and the rest of his atomic nightmare had found him again. He rushed home and found his wife and child miraculously unhurt. In 1954, Japanese film director Ishiro Honda created a monster, named Godzilla. He had the head of a Tyrannosaurus Rex, crocodile-like skin, and stood erect. He was taller than most skyscrapers and he breathed fire -- atomic fire. He could live under water, as easily as on land, and when he decided to climb out of the ocean and stomp on Tokyo, there was no escaping him. His enormous feet crushed people like they were ants and cars and buildings like they were toys. Those who managed to get out of range would be incinerated by his flames. Godzilla was born from the radiation spread by Little Boy and Fat Man, and the monster became their metaphor. To most Japanese, the death and destruction caused by two bombs was incomprehensible. They badly needed a monster they could actually see. About 165 people are known to have survived both bombs. They needed no metaphor. At age 89, the death of his 59-year old son prompted Yamaguchi to finally tell his story. Why was he spared, when so many others were not? “Having been granted a miracle,” he said, “it is my responsibility to pass on the truth to the people of the world.” So, he lobbied the Japanese government for official recognition of being a survivor of both Hiroshima and Nagasaki. He had to battle the bureaucracy to get it, but he eventually prevailed. Being the only officially recognized double survivor gave him a platform from which to make his plea for nuclear disarmament. On March 11, 2011, the newest Godzilla climbed out the ocean and began stomping on Japan. It is gone now, but its devastation and its atomic breath remain. Tsutomu Yamaguchi died on January 4, 2010. I am glad he missed it. I think he had seen quite enough.